Predictive Analytics: The Next Big Thing in Real Estate? Get the basics, including some lounge chairs, an umbrella, a hammock, and an outdoor table so you can enjoy meals or games outside. In addition to patio furniture, you may want to buy or build an outdoor fire pit. It’s a simple feature that adds so much to your backyard. Sit around the fire and socialize, roast marshmallows or even cook dinner on your own backyard fireplace. You’ll want to add a splash of color to your patio so it’s eye-catching and sings of summertime. Buy some bright-colored, comfortable throw pillows and cushions to spice up the furniture. The bright colors and fun patterns will entice people to sit down, relax, and enjoy your backyard paradise. Nothing is more magical than twinkling lights against a royal-blue evening sky. Add strands of tea lights or other innovative lights to create a fairytale effect in your backyard. In addition to the decorative lighting, you’ll want to consider adding sensor or smart lights to your backyard for added security. Smart lights are a great way to ensure the backyard is lit—you can even control smart lights with your smart phone. 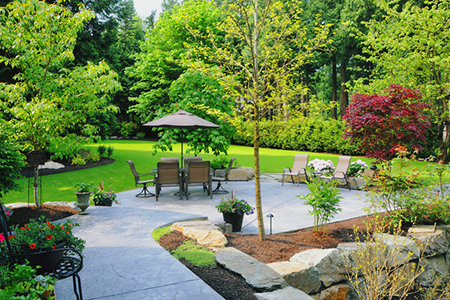 Landscaping can make or break your backyard. It’s essential to take time to update your landscaping to create an outdoor paradise. You don’t\ need extravagant plants or trees to make your backyard grand. Take some time to cut back unruly trees and bushes, pull the weeds, water and trim the lawn, and plant flowers around the yard. These simple updates will make a world of difference. You’ll have your own secret garden in no time! Once you’ve created a magical backyard space, you’ll want to take the necessary precautions to safeguard your belongings. Make sure your garden tools and supplies are in a locked shed—away from kids, pets, and burglars. Take time to assess the backyard for any security breaches. This will keep your family safe and protect your backyard, patio, and deck from major damage.